Watching and playing football is a quintessential American pastime, and scores of people enthusiastically await the beginning of its season each fall. The very nature of the sport makes it a risky venture for many participants. 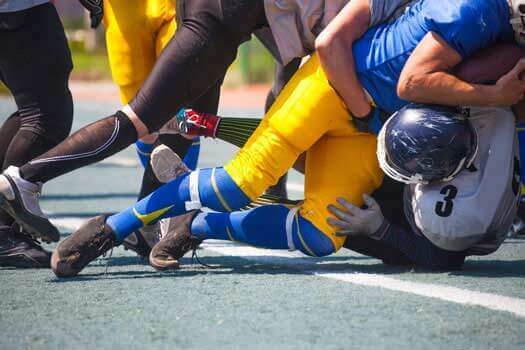 Urgent care centers and hospital emergency rooms see thousands of athletes each year with complaints of neck and back pain after being injured during football games whether played on the field or in the local park—some even require cervical or neck surgery. Following a few guidelines may help players avoid cervical and spinal injuries out on the field. It is extremely important to prepare the body for any strenuous activity or sport. Muscles that are put to the test prior to warming up, or before being strengthened to endure hard work, are prone to strains and sprains. A strain occurs when a muscle or tendon is pulled beyond its natural limits, and a sprain is a tearing or overstretching of a ligament. Athletes who are diligent about building up the muscles of the body’s core and around the cervical spine can help protect the muscles, tendons and ligaments from injury. The strengthened area also creates a strong fortress around the entire spinal column that helps guard it from serious harm. Many players have a natural tendency to duck their heads down when tackling. Keeping the head lowered during impact puts athletes at a greater risk for neck and spinal cord injuries. Keeping the head erect and eyes forward when hitting an opposing team member offers better protection for the cervical spine. A dramatic decrease in injuries has been seen since many athletic programs have eliminated the face and head as contact points. Oftentimes, people sufficiently warm up before play but neglect to properly cool down after strenuous activity. Failing to bring the body back to a safe resting state can result in sore, tight areas that are prone to injury. Gently stretching overworked muscles helps them to become supple and ready for the next bout of activity. Many teams have chiropractors or staff who are able to identify problem areas and correct them through manipulation and massage. When overuse has resulted in chronic pain that doesn’t abate when treated conservatively, it might be time to consider spine surgery. For more information on treatment options, call (310) 828-7757 and start your journey toward a pain-free life.